[New for 2010, entire product line discontinued] The fine folks at Starbucks marketing group were kind enough to send me a few coupons to try their new limited edition flavor. I returned this favor by shopping at every store that didn't have the new flavor, and when I finally did find it (at a Walmart), I forgot my coupon. Ok, can't give up. I headed back to the store with coupon in hand (well, pocket). I picked up my pint, headed for the checkout, and then promptly forgot to use my coupon. Therefore, this review is sponsored by, well, me. 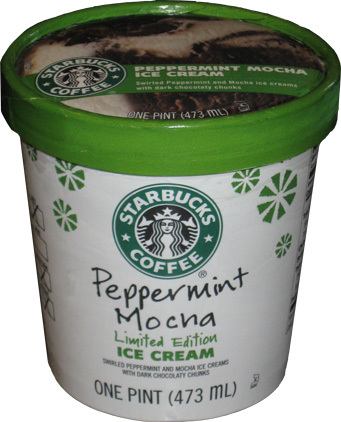 For the Fall and Winter we now have Starbucks Coffee Limited Edition Peppermint Mocha ice cream. 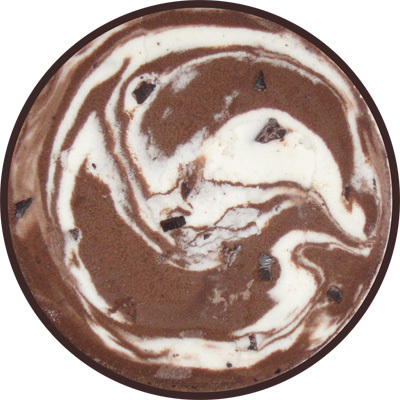 This holiday inspired carton is full of " swirled peppermint and mocha ice cream with dark chocolaty chunks ". I'm not a fan of mocha, but it's better (more mild) than coffee flavor, so maybe this will work for me. Look how bright white the peppermint ice cream looks next to the rich brown color of the mocha ice cream. This may sound like overkill, but it really is a stunning ice cream to look at. I appreciate the distinctness between the swirls and we've got a decent scattering of dark chips mixed in. Maybe this won't be so bad. I take my first bite and my first instinct is to spit it out. I'm sorry, but the peppermint mocha funk was something I was not prepared for. However, this is quality ice cream and Starbucks was nice enough to contact me about it, so I gave it another shot. Ok, the second bite isn't so bad. I continue on with small bites and really start to settle into a nice peppermint flavor that is highlighted with mocha undertones. I try to focus on the peppermint and the crunchy little chips scattered thoroughout. I do get a little hung up on the mocha at times, but when I'm done I am actually tempted to get a few more scoopfuls. I can see this being a big hit with a lot of people.... those who love both peppermint and mocha anyway. Ok, I don't know how many people are like that, but they're going to like this one without a doubt. As for the rest of us, well, it's definitely different. I'm having a bit of a problem with a lingering mocha aftertaste (plus it's got a little peppermint bite to that mocha aftertaste). Hmmm, that's not a winning point for me here. It's two hours later and I, well, I just burped mocha... excuse me. This is a really well done ice cream, it's just not for me. This is a great step by Starbucks to branch out and I applaud them for doing something that hasn't been done in the mainstream yet. I hope they keep it up and look forward to tasting their next flavor. Flavor Note: I had forgotten that Strawberries & Creme Frappuccino is actually a limited edition flavor and will be around spring and summer (as in the opposite of Peppermint Mocha). I tried this ice cream last night and LOVED it! As a huge Starbucks, mocha, chocolate and peppermint fan, it was the best. However, I think that in order to truly enjoy this ice cream, you must really appreciate this flavor combination.